Some times, with all of the concrete and buildings. the motivation to escape the city limits and venture into less charted territory becomes overwhelming. On this fine weekend in April, I flew the coop. Traipsing along trails in the in the George Washington National Forest, it was great not to think about the things that bog down life - including internet and email (sigh) - and to get some more "tree" time in. One of my favorite things about hiking is, what I feel, justified free reign to consume trail mix to my heart's content. With chipmunk-like tendencies, any way, I seem drawn to the mixture of nuts, seeds, dried fruit, and chocolate. But, by the end of a day of hiking, it is often nice to have a cooked meal. Though my outing experience is not extensive, I have become relatively adept at concocting relatively "gourmet" camping dinners. Usually, these rely on quick-cooking dried soups and grains. This time, some couscous, smooshed tomatoes, leftover salad mix, and a seasoning packet (called Poultry Magic, but no fowl play there...) made a really delightful meal. 1. 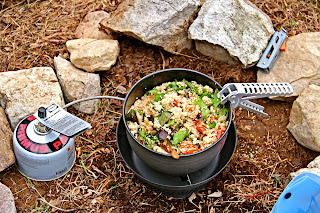 Bring water to boil in a camping stove. Turn off gas and add couscous. Allow to sit for five minutes. 2. Mix in chopping tomatoes and seasonings. Add greens right before consuming. Voila! * I added in a quinoa option for a gluten-free, and more nutrient-dense option. Please note, that the preparation is slightly different for this, and will require more time. Add an extra half cup of water, add quinoa while water is boiling and let cook for about 20 minutes. Once the quinoa has cooked, you can add other ingredients. I have made quinoa on camping trips before, so am confident it works! ** Fresh greens not recommended past a day or so without refrigeration (unless it's pretty cold outside). Check out this recipe and more on Wellness Weekend and Slightly Indulgent Tuesday!